My favorite band currently and hopefully forevermore is MuteMath (or Mutemath, MUTEMATH, Mute Math, whatever). Their 2011 album Odd Soul is basically the best thing to happen to music within the past few years (and their newest album is coming out next year I AM SO BLEEPING EXCITED). I show my affection everywhere so the world knows of my love for them, but now my fridge can get in on the action with this DIY magnet! What better way to show my obsessive fandom than get as much merch as possible, right? I've got bumper stickers, a T-shirt I use in my embroidery hoop wall art (only because it got too small on me and GOOD GOD I'm not giving it away), the albums of course, and so many buttons and flair I don't know what to do with. 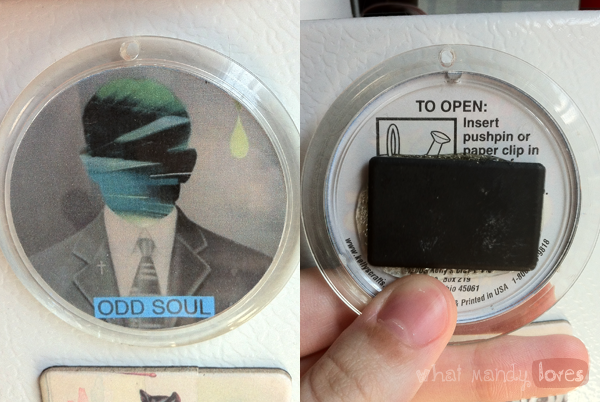 Sadly I haven't been able to find any MuteMath magnets, so I decided to create my own. There's plenty of ways to make your own change-out magnets, but this DIY will show off how to use an old keychain. 2. Get your design ready. Either find an image to print or get a photo printed. Make sure it's in the correct size or the element you wish to cut around is big enough for the keychain frame. 3. Get to cutting! Use the base paper from the keychain on top of the design you're using to cut out the correct size, or trace the base paper over the design and cut. As long as you have the right measurements, it's going to fit in the keychain. 4. Place your cut-out design inside the keychain. How does it look? 5. Use your fingers or pliers to remove the chain. 6. Glue the spare magnet to the back of the base. If your keychain is a pop-out one like mine (see image below), make sure the magnet fits on the back panal and no glue gets around its edges so you can remove the panal without removing the magnet. 7. Let this dry for a few hours. 8. Stick your new magnet on your fridge or other magnetic surface and admire the awesomeness! 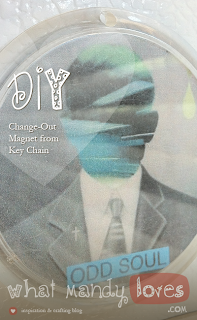 How have you created your own magnets? Any alternative DIY's out there you'd like to share? Let me know in the comments. Image: MuteMath's Odd Soul album cover.